We catalyze customer success by creating innovative solutions to their most pressing technical challenges. We value high levels of talent, achievement, and performance in all endeavors and in all customer relations. We value efforts that promote the success of our customers. We value a pioneering mindset when developing technical solutions and pursuing business opportunities. We value honesty with our customers, in our scientific pursuits, in our business dealings, and with our people. We value people willing to grow and who are committed to maximizing the impact of our team. Numerica was born in the seat of an ugly La-Z-Boy recliner. This is where it all started. In the belly of the Brown Bomber. 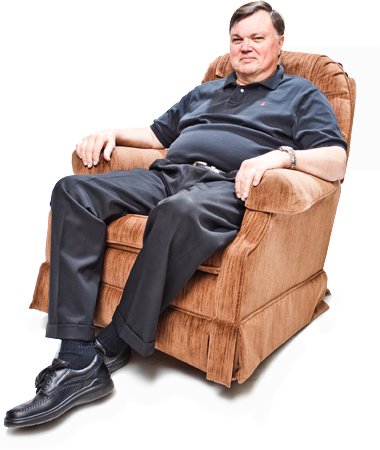 Never underestimate the power of a humble rocking chair with synthetic upholstery to inspire greatness. The Brown Bomber reminds us that innovative companies often start as a single thought in the head of one person, but it takes the support of a talented team to transform that idea into a sustainable business. Numerica is the result of a scientist being told, “It can’t be done,” and then surrounding himself with good people to expand the limits of what is possible. In the late 1980s, IBM approached Colorado State University applied mathematics professor Aubrey B. Poore with a difficult problem in distributed target tracking. Poore led the joint academic-industry team that created the robust Multiple Frame Assignment (MFA) tracking solution, which eventually generated four U.S. patents (No. 5,406,289, No. 5,537,119, No. 5,959,574 and No. 6,404,380 B2). The revolutionary MFA tracker used new sensor data to improve tracking decisions made in the past. The new technology enhanced the capability of surveillance systems by improving tracking capacity, fidelity, maneuver detection, tracking accuracy, data fusion and processing time. The award-winning and patented MFA tracker soon gained national attention, and was selected as a “Best of Breed” solution used to upgrade the AWACS surveillance plane. With strong support from the Colorado State University Research Foundation, Numerica acquired patent rights to the MFA tracker from the university, giving us exclusive control of our flagship product. Soon after, Numerica incorporated and began licensing the MFA Tracking System, which has influenced – and will continue to inspire – next-generation work at Numerica. In 2003, Numerica secured a major licensing agreement with Spectrum Astro (now General Dynamics), which transitioned our MFA tracker to the Spectrum Astro-led team competing for the Space-Based Infrared System (SBIRS) program. The revenue generated by this license provided Numerica with additional capital, allowing us to grow efficiently without incurring debt. Today, Numerica employs a rapidly growing team, and two-thirds of our technical staff have Ph.D.s in electrical engineering, applied mathematics, physics, computer science and related fields. Our teams develop advanced algorithms and software for tracking targets, fusing data, integrating networks and quantifying uncertainty. We serve customers in the areas of defense, intelligence, and law enforcement, and our state-of-the-art technologies have been deployed around the world. The Brown Bomber is proof that success happens when you sit back, relax, open your mind to possibility, and recognize that you often find strength in numbers.